In an earlier post entitled “They Hailed from Donegal” I wrote about my Sweeney family of Co. Donegal. Shortly afterwards I posted an enquiry on West Ulster Genealogy Face Book page hoping to find someone else who is researching this particular “crooked branch” of my family tree. Within less than twenty four hours Boyd Gray, owner of the page and the West Ulster Genealogy website; had shared my blog post and better yet responded to my query. 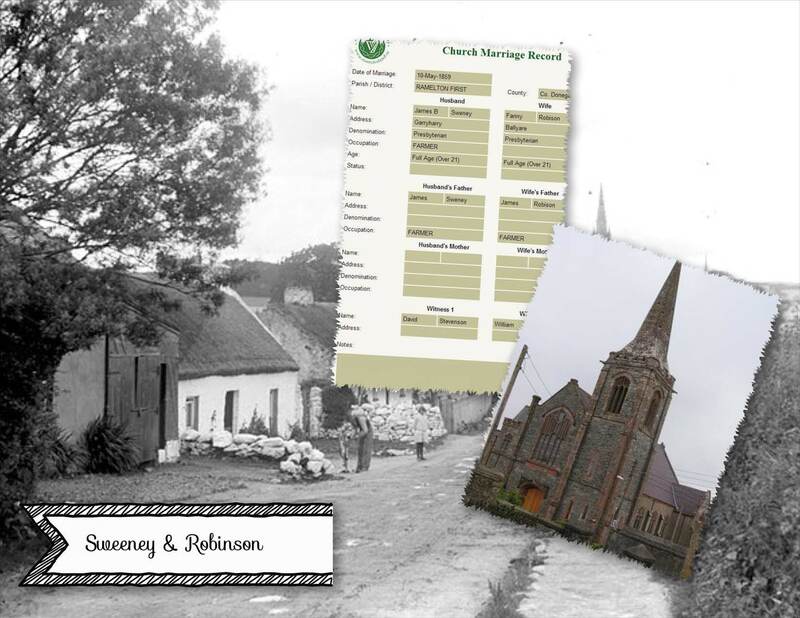 Their marriage record shows that James was from Garryharry and Fanny was from Ballyar. Ballyarr is in the Parish of Tullyfern; two miles west of Ramelton and eight miles north of Letterkenny. As always, with records in Ireland prior to 1901; it’s incredibly difficult to find older generations! However, Griffiths Valuation records identified the exact spot where Fanny Robinson lived; and probably the house where she spent her last night before marrying James. That discovery, along with a map of the property; proved that a photo I have in my possession is of the remains of my Robinson family home! Further Griffith Valuation records showed that my 3rd great grandfather James “McSwyne”, father of James Baxter; held Plot 22 of 26 acres in Garrowcarry. The property is situated in the Parish of Kilmacrenan; approximately six miles west of Letterkenny. With the help of an Ordnance Survey and an ariel view of the property today; a discovery was made! What looks like the original family homestead is still standing! Who is living in the ancestral home today; is it living family? Yet another “twisted limb” to follow! 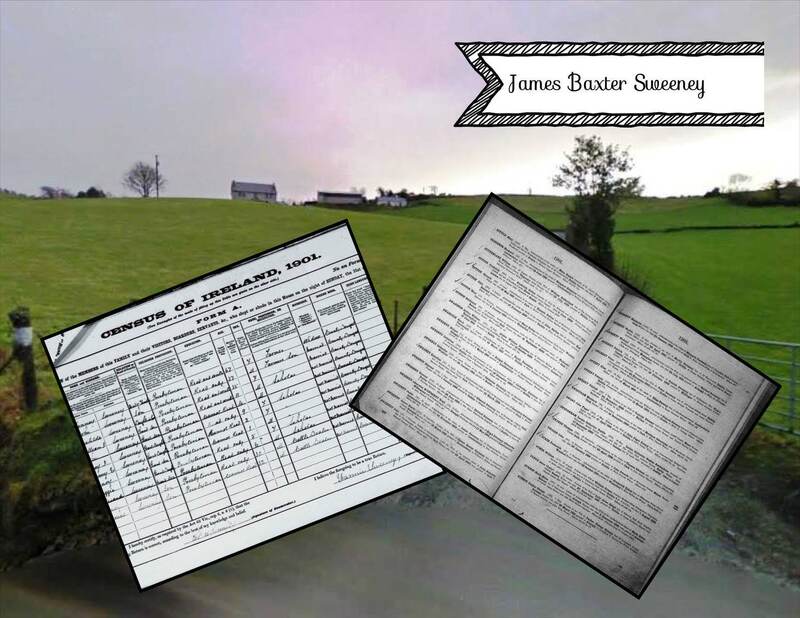 James Baxter Sweeney died in his late sixties on 16 Mar 1901; shortly before the Census was taken. 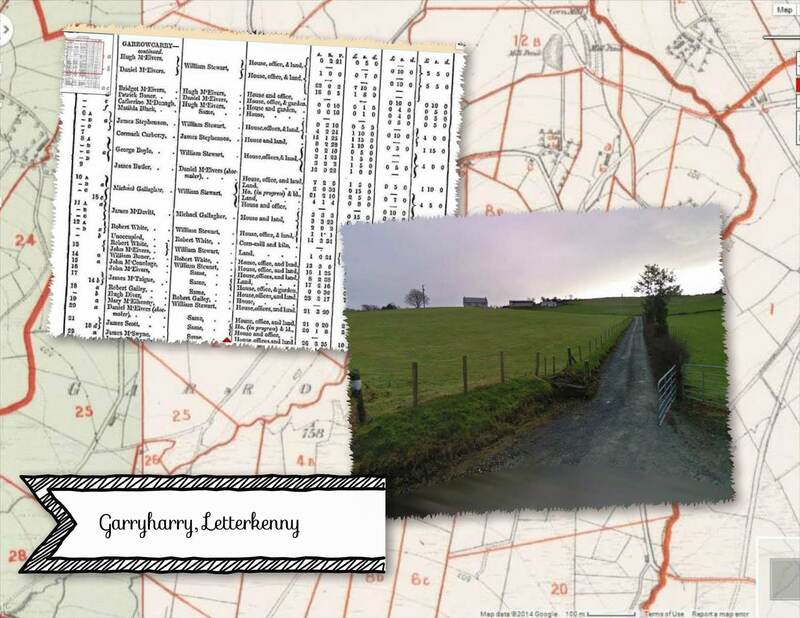 His Probate Record states: “Probate of the Will of James Baxter Sweeney late of Garryharry, Co. Donegal, Farmer who died 16 Mar 1901 granted at Londonderry to William J. Wilson and Samuel Russell Farmers. Effects £77. “Who are William J. Wilson and Samuel Russell? As always more digging is required. James’ burial record remains elusive as does Fanny’s death record. In receiving all of this new information, and validating other information I had gleaned over the last several years; I thought “Christmas had come early”! It would seem that the “season” wasn’t over just yet! As Sweeney tends to be a predominately Roman Catholic surname and my Sweeney’s were Presbyterian, I was hoping they might be a little easier to find. Their children were also baptized in the Letterkenny Presbyterian Church. 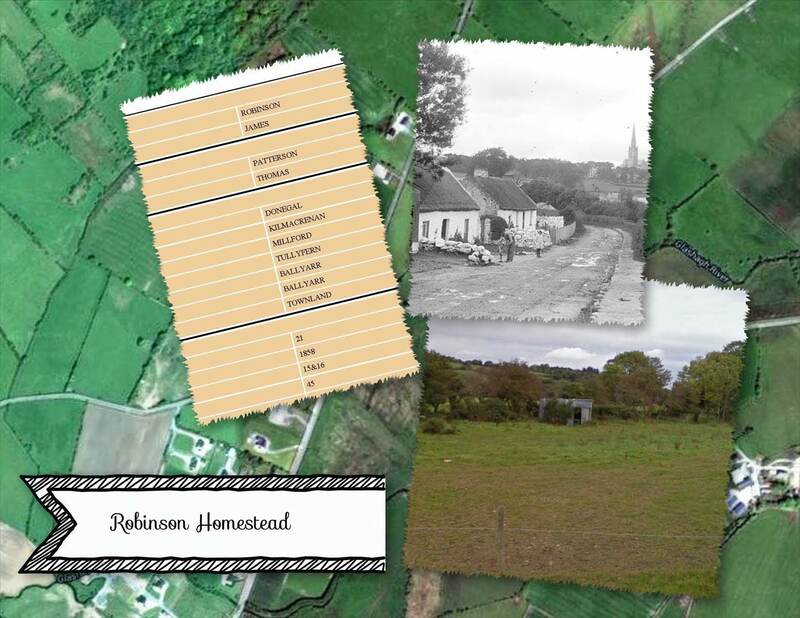 As James died in Garryharry, Louise Hamilton, owner of the East Donegal Local & Family History Face Book page; suggested that they might be buried in the Gortlee Cemetery which is a Presbyterian Cemetery in Letterkenny. She also offered to go on a little excursion and check out the cemetery. Although James and Fanny’s burial ground is unknown; some of my Sweeney’s are interred in the Gortlee Cemetery. Buried in Gortlee Cemetery, Letterkenny are my great grand uncle John Sweeney, his wife Matilda Graham and three of their children. In 1911, at the time the census was taken; the family was living in 16 Garrowcarry, Ednacarnan. As Louise indicated, “It looks like the headstone has been recently erected and the names all added at the onetime”. So, the search continues for my living Sweeney family in Garryharry! 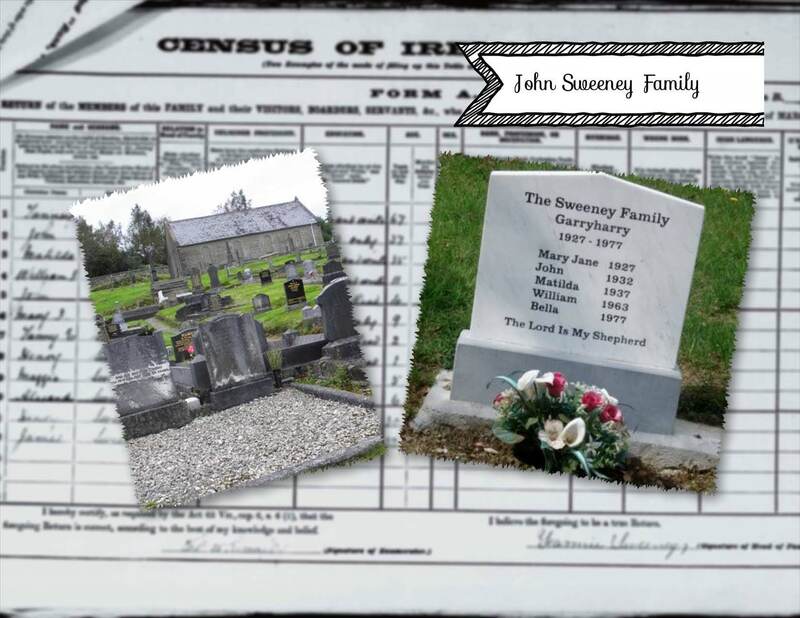 This entry was posted in Burial Records, Co. Donegal, Family History, Geneaology, Ireland and tagged Burial Records, Co. Donegal, Family History, Garryharry, Genealogy; Ireland; Records, Gortlee Cemetery, Letterkenny, Robinson Family, Sweeney Family. Bookmark the permalink. It’s amazing what the internet can do, isn’t it! How many cameras are you taking? One with lots of “storage”; several USBs… just in case; I think I would throw up if I lost them after getting home! Then I borrow one from my cousin as well when I’m there; I’ll need several volunteers too! 😀 Last visit was for two weeks, I brought back over 3000 images; headstones, old family photos and documents dating back to the late 1700s. That was two years ago and I haven’t yet entered them all in my tree! I NEED to retire to do this full time! Just saw you comment after writing my comments gpcox….so agree, it is amazing what we can now search and find…esp when we live 1.000s km away on the other side of the world….. It sounds like you are making great progress too! It’s so hard to stay indoors when our winter is FINALLY over and we are having some beautiful weather! BTW, I did get your email and did respond. Thanks so much! Bye for now!